Killer whales travel in groups (called pods) of up to 30 individuals. They produce discrete calls that are specific to their pod. Photo credit: Kim Parsons/NOAA Fisheries. Marine mammals that live together have developed a communication system that allows them to maintain or regain contact with group members over long distances. Individual animals often leave the group during feeding and are able to reunite with their group members by producing and recognizing vocalizations that are specific to their group. Group-specific vocalizations also allow members to maintain cohesion when more than one group of animals is in the same area. The group-specific vocalizations allow members to identify other members in their group. There are a number of cetaceans that have well-documented group-specific sounds, including killer whales and sperm whales, and spinner dolphins. There are several “ecotypes” of killer whale groups found off the Pacific Coast of North America: “resident”, “transient” or “Bigg’s” killer whale, and “offshore.” Resident killer whales live in the same group or pod their entire lives and eat mostly fish and squid. Transient killer whales separate from their birth group to form smaller social units. Transients also have a wider geographic range than residents, and hunt marine mammals, such as other cetaceans, seals, and sea lions. Offshore killer whales are not as well studied as residents and transients, however, it is believed that, like residents, they feed mostly on fish. They also maintain an offshore distribution with a much larger range than residents or transients and form very large group sizes comparable to multi-pod associations seen in residents. All killer whales produce a number of different vocalizations that include whistles, clicks, and pulsed calls. Transient killer whales tend to hunt silently, possibly because their prey (marine mammals) can detect their calls. In contrast, resident killer whales hunt using echolocation sounds, and the fishes they eat do not readily detect high frequency sounds. Killer whale pulsed calls are important group-specific vocalizations and are thought to be used in coordinating behavior and group recognition. They are divided into three categories: discrete calls, aberrant calls, and variable calls. Discrete calls are stereotyped and are unique to each pod. They are mostly associated with identifying a pod group, maintaining the pod, and coordinating group members. Members of the pod use discrete calls to keep track of each other’s location while they are feeding out of sight of each other. Aberrant calls are similar to discrete calls that have been modified. Variable calls are used by many pods and are more associated with social events. 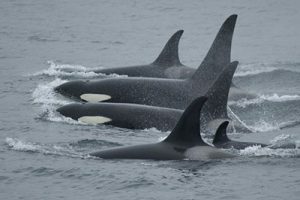 Some pods share a proportion of their repertoire, and are grouped into acoustic “clans.” For example, in British Columbia, there are three northern and one southern resident “clans.” Resident killer whales also produce stereotyped whistles, which are shared between clans and may be useful for community-level recognition. Pictured below are spectrograms of two different discrete calls, N7 (left) and N8 (right). All eight pods within the A-clan off the coast of British Columbia, Canada, produce both of these call types, among others. However, different pods within a clan may produce the same call type slightly differently, as can be seen in the four subtypes of calls N7 & N8. These two call types are closely associated, with N8 calls typically being produced only after an N7 call. N7 calls are frequently produced during socializing and foraging. The calls from pod N7 are more tonal than the calls from N8. Often whistles and pulsed sound are seen in the same vocalization. Notice the abrupt change in call frequency and structure with one call. These quick changes are thought to increase the chances of detection and localization by the listening whale. Sperm whales also produce sounds that are shared within groups. These sounds, called codas, are stereotyped sequences of broadband clicks, which are differentiated by their rhythm, or temporal pattern. Codas are thought to serve a communicative function because they are produced primarily during periods of social activity. Sperm whale social structure is quite complex, and coda repertoires are thought to play a role in social interactions. Adult females and their immature offspring live in social units that may persist for decades, and it has been suggested that calves may learn coda dialects from their mothers. Within a social unit, most animals share common coda types, and social units can be assigned to large-scale vocal “clans” based on the shared usage of particular codas. These clans may include thousands of individuals spanning thousands of kilometers. Females tend to associate with other social units in the same vocal clan, suggesting that coda repertoires may contribute to broader level of social organization across ocean basins.